ThreeHundredEight.com: Polls agree Tory will win Toronto race. Will voters? Polls agree Tory will win Toronto race. Will voters? The race for the Toronto mayoralty is finally coming to an end today and the polls are unanimous: John Tory should defeat Doug Ford and Olivia Chow by a comfortable margin. The polls are in remarkably close agreement, showing little variation that cannot be explained by normal sampling error in polls done over the last two weeks. But will voters do what they have said they would? First, the averages. The weighted averages give Tory 42.8% of the vote, putting him a little more than 10 points ahead of Ford. He has averaged 32.2%, followed by Chow at 22.2%. Support for other candidates has averaged 2.8%. These numbers have been steady for some time. Since the beginning of September, Tory has averaged no lower than 40.4% and no higher than 46.4%. He has led since the end of July. Support for Ford has been steady since the end of September, not wavering from a range of between 30% and 34.3%. That does suggest he ends this campaign with slightly more support than Rob Ford had when he bowed out. For Chow, she has been stuck since the beginning of August with between 22% and 26.7%. She lost the lead in July and fell to third at the end of the next month. She never recovered. All of this stability might be showing the effects of a long race. After months and months (and months) of campaigning and debates, people have made up their minds. And so have the pollsters. There has been extremely little disagreement between them. If we go back over the last two weeks of the race, we see that Tory's support has registered between 39% and 44% in every single poll - between 42% and 44% if we look at just the last five. That is incredibly consistent. There has been a little more variation for Ford (29% to 34%) and Chow (21% to 25%) but those are marginal differences. Rarely do we see numbers clustered together so closely. If we look at just the final three polls, we'd see a range for Tory of between 42% and 44%, Ford between 31% and 34%, and Chow between 21% and 25%. That would suggest a clear 1-2-3 finish for the three candidates. But let's extend that further, taking into account the margin of error for the highest and lowest results for each of the candidates. When we do that, the ranges for Tory extend to between 39% and 47%, with Ford between 28% and 36% and Chow between 18% and 28%. There are a few different scenarios in those ranges: a huge Tory victory by a margin of almost 20 points, or a close result with a margin of just three. Chow could finish in third place by a large degree, or potentially could narrowly edge out Ford for second. If anything is going to skew these numbers, it could be turnout. It is always woefully low in municipal races, and I suspect that it might not be too high today either. If it was a closer race or if Rob Ford was still on the ballot, there could potentially be more interest. But as it stands, Doug Ford is not in range to win and Tory is not the kind of 'exciting' candidate that people will turn out in droves to vote for. On the other hand, the mayoral campaign has been so present in the lives of Torontonians for the last year that perhaps they will turn out in large numbers anyway. We'll see. If turnout is determinant in the outcome, it seems that Tory should still have an advantage. Ipsos Reid gave Tory 51% support among likely voters, a gain of nine points over his standing among all eligible voters. Mainstreet Technologies gave him a boost of two points to 44%. Both pollsters agreed that Ford would take the biggest hit, dropping him by five to six points. For Chow, it was a bit of a wash. All signs point to a Tory victory today. Though only a few firms were active during the race, polling in the campaign seemed omnipresent. In the end, they all agreed on the final outcome and were more or less in line throughout the last year. Will they be vindicated or could a surprise be in store tonight? Only a few hours remain before we'll find out and Toronto's long ordeal will be over. This is about as close to a guarantee as I've seen in a long time. And the majority of votes will show that "Anybody But Ford" was viable. This campaigned showed an ABF campaign was not viable; Chow offered herself as the ABF candidate and was rejected. It will take the right candidate to defeat Ford. That is the lesson; AB Movements are inherently weak-their message is one of negativism and because they are against not for anything policies are not as developed or thought-out. They only hold positions that are juxtaposed against something else and so, they lack fresh ideas, innovation and insight. Consequently only a charismatic candidate is suitable to lead ABMs- Olivia Chow is not charismatic, as a result she was pushed to the side. This should serve as a lesson for the Left in Toronto; two elections in a row their candidate has been defeated. The Left needs to understand the University-Cabbagetoiwn-OLP-ONDP cabal does not have the democratic legitimacy to foist their candidate upon Torontonians. They need to develop a better mechanism to pick their candidate other than the order coming down from up high (the premier's office). This election should serve as an impetus for Toronto to join the 20th century and develop a municipal party system. No way would I support a municipal party system in Toronto. The party systems at the provincial and federal levels are bad enough, thank you very much. I think Toronto works just fine without one. 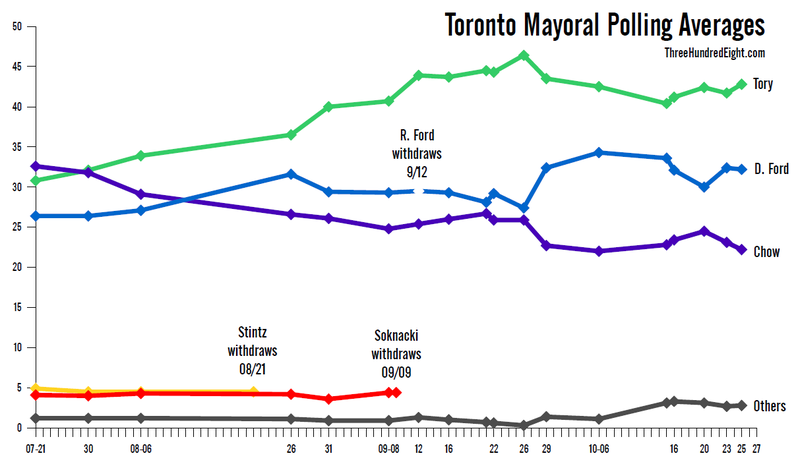 Rob Ford started his term with a majority of councillors on his side, but ended his term as a distinct minority voice. That is how it should have been, and this is something that would not have been possible if Toronto had had a party system. Sorry bede but ABF carried the day ! No it did not. Chow was the original ABF candidate she was third! It took a candidate who was more than simply an ABF candidate to win-that was John Tory. The important thing is 73% of Torontonians voted for a conservative. Bad news for the Liberals. a cabal is a secretive political clique or faction...much like the crowd who encouraged Chow and Smitherman to run. wrong bede. Any candidate was an ABF candidate. Chow ran a poor campaign and paid the consequences. Tory did a good job and had the image to succeed. But the really great thing is the Ford Nation lost !! And that's superb !! I don't know what's in the water where you live but, it makes for some strange logic. "Any (sic) candidate was an ABF candidate". No Peter, Doug Ford was not an ABF candidate, if all candidates were ABF (except a Ford) the vote would split and F would be elected. For ABMs to work one candidate must have primacy vis a vis the other AB candidates otherwise it's just an election. I'm glad you think Toronto works well, I think it does not. Taxes are nearly double the tax rate in Vancouver! Toronto has 2 subway lines, Vancouver has 3 lines and building a fourth, although admittedly not all of them are underground. Parks in Toronto are good but, I could mention a few cities with better park systems. As for your Ford analogy that is one way to look at it but, a party may have forced Ford out sooner to preserve their electoral chances. Ford held on for a year and a half, this caused confusion and at the end of the day although his powers were limited he was still the Mayor and face of Toronto. Given the high numbers at the advanced polls, I'd expect a high turn out today. Tory may be bland, but the people's desire to get rid of Ford and move on from the last four years is not. 1) Telephone polls do include cell phones. 2) Polling did not 'almost universally' predict a PC victory in the last Ontario election, but rather a Liberal victory. Only question was whether it would be minority or not. The IVR polls he criticizes were the ones that called a Liberal majority. There was a bit of an upset last week in the Mayor's race in Winnipeg when Bowman ended up unexpectedly winning by a large margin. Could we see another surprise in Toronto tonight? Probably not as likely, since there's been so much more polling in Toronto and the likelihood of a major error is lower, but it's possible the margins could be different than what the polls are showing. John Tory will win, but for us political junkies its more than just who wins. I wonder if the today's result will match the polls. Can Doug Ford really motivate a third of the city's electorate to the polls? Will traditional Olivia Chow supporters vote strategically or vote with their hearts? Can John Tory win in every region of the city? How will council look like? The mayoral races in nearby municipalities such as Mississauga, Brampton, Richmond Hill and Markham will be interesting to watch too. The local politics and dynamics of those cites may produce some interesting results. My prediction is a surprise win by the weird clown that's running. Not Doug Ford - the actual clown. I can see Doug Ford pulling out an upset. Taxes are far too high in Toronto. A $7,000 per year property bill is normal! That is a higher tax rate than Vancouver and, three times the taxation levels of Calgary or Edmonton. The median income in Toronto is about $73,000 per year. I predict the PCs will win all four Alberta by-elections. Some people think Calgary-elbow could go to the Alberta party but, I don't think this affluent neighbourhood will turn down a powerful cabinet minister just so it can "make a point". The Alberta party, Liberal party ANDP and Wildrose all lack strong organisations outside a handful of ridings. The PCs have a proven track record of getting their voters to the polls. Hence, a PC sweep. Thanks-it's called the internet we all have access to it! well, unless the advance poll results were very different, looks like Tory slightly underperformed and the others slightly overperformed. likely due to the sense of Tory being a shoo-in at the end of the campaign.... left some voters less motivated as they were unconcerned. How bad are Selinger's polling numbers? Could Quebec keep the Liberals from a majority?